The north Oregon coast abounds with tales of mysterious shipwrecks, lost castaways, pirates, and sailing vessels visiting the coast prior to the recorded expeditions of Captains Cook and Vancouver in the late 118th century, and farther north than the known voyages of the earlier Spanish explorers. 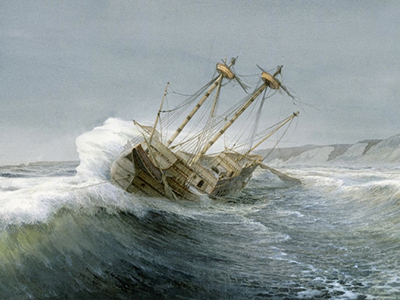 While written off for years as tall tales or Indian myths, there is historical and archaeological evidence that at least two unrecorded Spanish ships wrecked on the Oregon coast prior to about 1750, as well evidence for English castaways or deserters, Japanese junks, and possibly other vessels as well. Scott Williams, the lead archaeologist for the Maritime Archaeological Society's Beeswax Wreck Project, will discuss the Society's 10-year effort to locate the Beeswax Wreck, a Spanish Manila galleon that wrecked in Tillamook County near the Nehalem River. Scott will also touch upon the historical and archaeological evidence for other shipwrecks and survivors prior to European and American exploration and settlement of the Pacific Northwest. Scott Williams is a professional archaeologist with over thirty years of experience conducting archaeological research throughout the Pacific Northwest, the islands of the Pacific, and Australia, and he has worked for government agencies, private consultants, and the Bishop Museum in Honolulu. He is currently the Cultural Resources Program Manager for the Washington State Department of Transportation, where he manages the agency's archaeology and history program. Scott lives in Olympia, Washington, is married and has two teenage boys. In addition to his full-time job with the Washington State Department of Transportation, he is on the Board of the Maritime Archaeological Society and serves as the Principal Investigator for the Beeswax Wreck Project, a non-profit, multi-disciplinary team investigating a Spanish Manila galleon wrecked on the north Oregon coast in the 17th Century.